Introduce the Spanish language to your younger children by using simple tools that are fun while they learn. Start by showing your kids some basic Spanish words. Print this worksheet and let them learn the Spanish terms for different colors. First talk about the objects on the page. Then review the Spanish terms on the side. Next, ask them to color the scene with the correct marker or crayons according to the colors indicated by each number. A large fill-in-the-blank is provided beside each Spanish word to relate it back to English. These are free printable activity worksheets that are easy to download and print. Colors In Spanish is a free printable worksheet designed to incorporate learning with a hands-on approach. Most children will retain the information better if they have engaged in a physical activity while learning the lesson. The sheet is geared toward younger and first introductory Spanish lessons. The coloring activity works to solidify the color with the Spanish word by asking the student to color the numbered objects with the appropriate crayon and fill in the English word in a blank next to the Spanish term. The lines are clear and simple to follow so younger kids will enjoy without getting frustrated. Learning a new language is easiest at the earliest age possible. 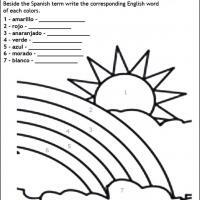 The free printable Colors In Spanish worksheet combines easy to read and to color pictures and words. The instructions are easy to follow too. Children will love coloring the bright and large Sun and Rainbow all the while they are learning a new skill. Teachers do you have a Spanish speaking child who needs an easy introductory start for the English language? Print this worksheet with the familiar Spanish terms and have them write the English terms beside them as they learn the colors from the picture. Free, easy, and fun for all ages.